George was active in the church throughout his childhood, had read the Bible and studied theology. His Catholic high school helped him obtain a scholarship to a Catholic college. He had even said at one point that he considered the priesthood. But George left organized religion by the time he was in his later teens. 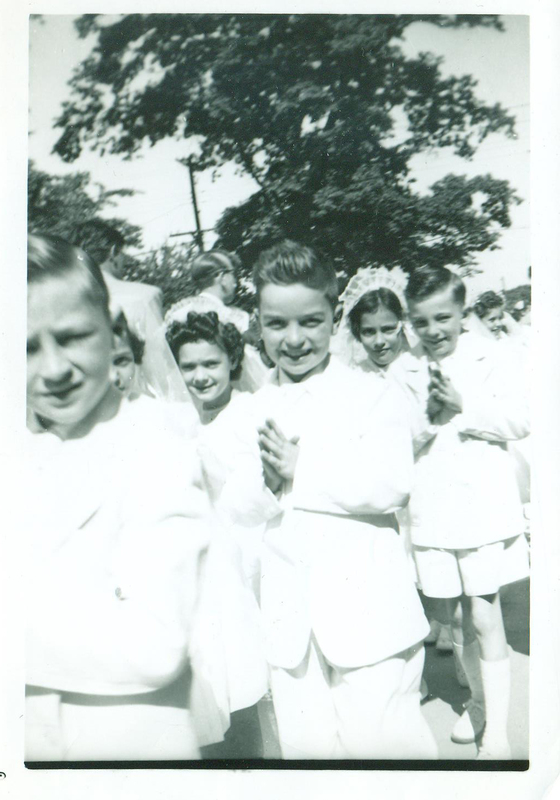 George's first communion, Linden, New Jersey, in 1955.When we got together he said he was glad I was a Christian and was happy Dan had a chance to go to church with me. Over the years, he joined us occasionally at Loop Church, where I am a member and where our sons Sam and Josh were baptized. We also occasionally visited Faith UCC by our home, and Fourth Presbyterian, where we went to services and had Danny attend Sunday School for a time. He was happy for Sam and Josh to go to Christian pre-school and attend Vacation Bible School at Mt. Olive Church. He encouraged their summer, Christian activities like Young Life family camp with their grandparents and HoneyRock camp, where they studied the bible with Wheaton College students. 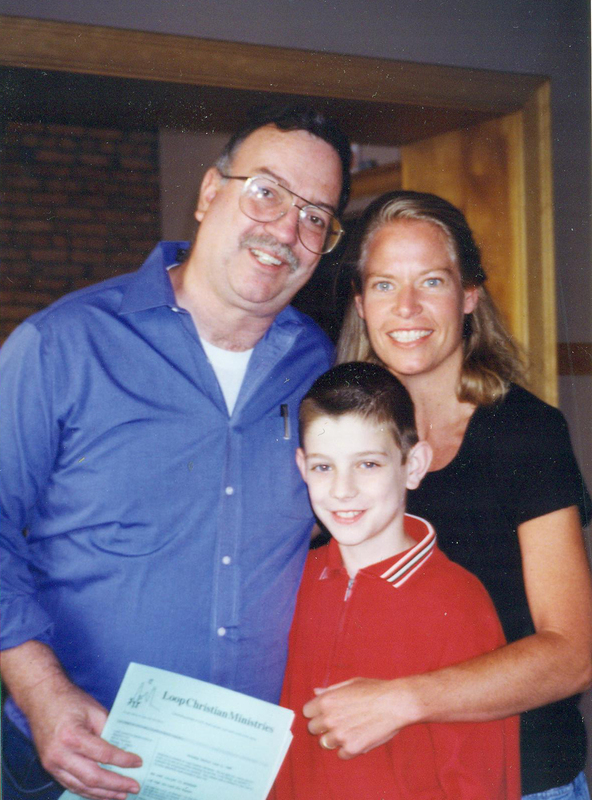 Attending services in 1999 at Loop Church, known then as Loop Christian Ministries.George liked us to say our short prayers before dinner. He hoped that his sons would have faith in God. I couldn’t convince him to join me in my understanding. He rejected the idea that people have a choice to follow God. He’d say, “You either have faith or you don’t, and I don’t.” However, in 2018 he returned to some openness to his Catholic roots when he began subscribing to the Jesuit-published magazine America. 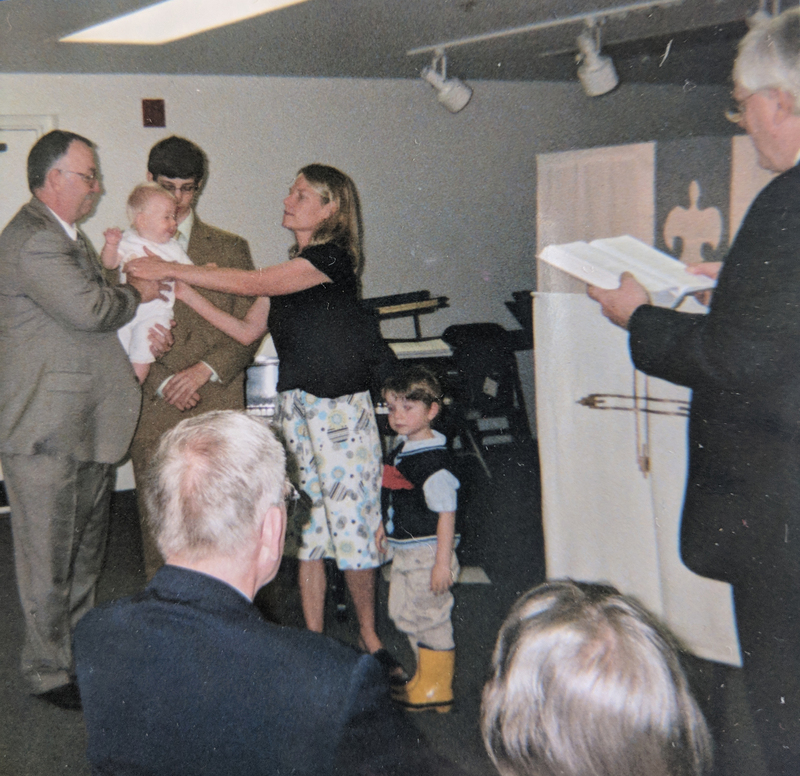 Josh Schmidt's baptism at Loop Church, May 2005.When we met and he told me he was an atheist, I asked him how you could make the world better without God.